Excerpt from "Common Sense Inventing"
This sections purpose is to show you a better way to get your idea noticed. Haven’t you walked through a store looked at a product and say “I thought of that years ago.” Or “That is so simple. Why didn't I think of that?” The answer is persistence. There are a large number of people with great ideas, but they just don’t have the fortitude to push their idea to the goal line. No one likes rejection and it seems even more demeaning from people you don’t even know. This rejection makes a large number of people give up on their first try. Granted you may have a bad idea. That is why I strongly stress finding a friend that will be brutally honest in their opinion of your idea. YOU DO NOT NEED A “YES” MAN or WOMAN! YOU NEED HONEST OPINIONS! Haven’t you ever had days when nothing seems to make you laugh, your favorite food just doesn’t satisfy you the way it used to. Remember the saying about never buy a car that was built on a Friday or Monday. You are getting a car built by people looking forward to the weekend and getting off work or they are coming in from the weekend and not wanting to be at work. This applies to the inventing industry for reviews. The reviewers are under a lot of stress to pick the right item for their company that will bring in money. The last thing they want is a bomb costing the company a huge loss in profits. You want to make your submission as easy and user friendly as possible making the reviewers’ job easier. Nothing turns off a positive review than the reviewer having to decipher your submission to get to the core idea you are pitching. 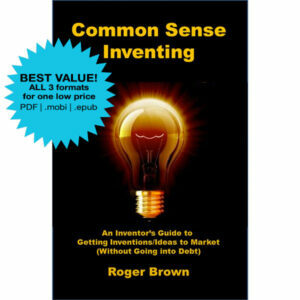 I would like to personally recommend, "Common Sense Inventing" to anyone who desires a real-world understanding of the inventing industry, and especially the intricacies of seeking profitable, long-term licensing without loosing your shirt in the process! Roger Brown clears away the stereotypical fog that leads many amateur innovators to spend literally thousands on a broken heart and crumbled dreams, with clear, straight-forward advice that is proven effective through many successful licensing deals.... WITHOUT going broke in the process! 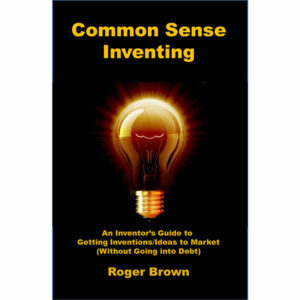 Roger Brown's "Common Sense Inventing" should be front and center of every inventor's library. Clear, concise, and relevant, Roger's new book is thorough, yet organized in a format that is easy to follow. If you are serious about bringing your product/idea to market, get this book. Below are some tips that can make you stand out from the crowd. Make sure your submission looks professional and check for misspellings. Before you send anything out reread your submission. Make sure you have included everything that is to be sent. Always send your submissions so that they get to them on Tuesday, Wednesday or Thursday. If they arrive on Friday it will be looked at by someone wanting to get off for the weekend. If it gets there on Monday you are put in the pile from the weekend mail and anything they left on Friday. Use a colored envelope to send in your submission. Companies that look at outside ideas from Inventors get a large volume of submissions. You want your submissions to be eye catching and stand out among the pile on their desk. Most people send the plain manila envelope. A colored envelope will stand out among the pile no matter where you are placed in it. Call the company you are interested in submitting your idea to and find out the exact person to submit your package. Make sure you have the proper spelling of their name. If possible keep a database with all the information of people you have contacted. You don’t want the embarrassment of calling the same person twice for the same reason. It is also a great tool to help you keep up with where all your ideas are at any given time. I get calls all the time from people that assume I know who they are and why they are calling. Granted I sent them material, but they are not the only ones I submit too. Make sure your contact information is on everything that you send out. You would not believe how many people think that they are the only one submitting ideas to that company. Your submission may be looked at by several different people in the company. So, the chance that something could get separated from your submission is high. When you do your write-up describing the invention DON’T send a 50 page report. Remember you are not the only person sending them ideas. You don’t want to take up the reviewers’ time. You need to be as concise as possible. Look at the back cover of any novel book and you will see a short description of the book. That short blurb is giving you an overall description of the book. You may decide to read a couple of paragraphs inside the book, but you will normally decide from reading the back whether you think the book is interesting enough to buy. You need to use that same rule for your description. Keep it short and to the point, but make sure it has enough to grab the reviewers’ interest and want to know more about your idea.There is an old practice among some reviewers the heavier theweight of your package the longer your wait for a review. Everyone wants things as short and easy to figure out. Think about it from this perspective. Would you rather read a pamphlet or a novel in order to understand a person’s idea? Don’t be a pest calling the reviewer every other day wanting to know what they think of your idea. The more you call the more you are killing your chances of them wanting your idea no matter how good it is. Companies want great marketable ideas, but they don’t want the hassle of an annoying Inventor. Have the proper attitude when submitting your ideas. Don’t think just because you came up with an idea a company will pay you a million dollars. I am not saying there are no million dollar ideas. I am just saying put things in the right perspective. It isn’t worth a million dollars if no one wants it. Plus, remember that the industry standard for royalties is 3% to 5%. So, unless you are getting a large amount per unit you will need to sell a lot of them to equal one million dollars in royalties. Most inventions on the market can give you good supplemental income and even give you early retirement. You just have to find the right item and company to market it. Make sure your submission fits the market audience of the company you are submitting to. You would be surprised how many people don’t do thorough research on the company and will send a tool idea to a toy company. Know your market! Let the company know if you have a prototype for your idea. Do not send it with your first submission unless they specifically ask for it. They don’t want to be responsible for a prototype they weren’t expecting. Also, this saves you and them postage.